A festival… dedicated solely to beer… how hard can it be to not screw that up?? Not so fast my friends.. let’s take a minute to give some props to Andy Ashby and the rest of the Cooper-Young Community Association for executing this year's Cooper-Young Beerfest. Location..perfect..selection of breweries..perfect..crowd control..perfect. This is an honest critique, from a guy that doesn’t enjoy beer all that much. This year's festival was held on October 15th, on a beautiful 81 degree day. It started at one p.m. and by 1:30 there were several hundred people there. By the end of the event, 700 people purchased tickets, up from 500 last year. Those 700 people paid $35 and in turn received a 12 oz mug and a slip with the list of breweries, and the flavors of beer they were offering. Thirteen breweries were represented, with more than 30 combined flavors. By the lines at the tents, Yazoo and Red Brick brands were crowd favorites. The festival was held in a vacant lot on the corner of Walker and Fleece across from LifeLink Church in Cooper-Young. Proceeds from ticket sales went to the Cooper-Young Community Association, who do a wide variety of things to try and make the neighborhood the best area of Memphis to live and hangout in. 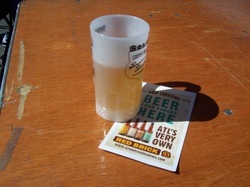 The breweries gave away their product for free, in the hope that the exposure would lead to more sales. Ticket sales were limited to 700 this year, more people than that wanted to attend. Organizers capped ticket sales at 700 to ensure that lines for beer would be quick, and the representatives from the breweries would get to talk to people about their product. Central BBQ had a stand, selling pulled-pork sandwiches and BBQ nachos. Of course for a beer fest, you must have a hotdog/bratwurst stand. Peter Dupont covers food & drink and recreation for MicroMemphis.